Christine Lagarde, managing director of the International Monetary Fund, concluded her one-day visit to Egypt on Wednesday after meeting with President Mohamed Morsi, Prime Minister Hisham Qandil, the Egyptian finance minister and the rest of the government's economy team. Lagarde said in a statement that an IMF technical team would visit Egypt in September to study the Egyptian government's economic programme. During Lagarde's visit on Wednesday, Egypt officially requested a $4.8 billion loan from the global financial body. The Morsi administration had invited Lagarde in hopes of kick-starting loan negotiations with the fund. The IMF and Egypt have been engaged in negotiations since early 2011, with the latter originally having requested a loan of $3.2 billion. This amount was raised, however, as pressures increased on the local currency due to the slow recovery of key sectors of the national economy such as tourism. Lagarde issued a statement on the IMF's website saying that Egyptian authorities had asked the IMF to support Egypt's economic programme "financially." "We are responding quickly to this request," the statement read. "A technical team will be arriving in Cairo in early September to work with the authorities on their programme and discuss possible forms of financial support from the IMF." She went on to acknowledge the difficulties associated with economic reform in Egypt. "Egypt faces considerable challenges, including the need to restart growth and reduce budget and balance-of-payments deficits," Lagarde added. "Getting the country's economy back on track and raising living standards for all will not be an easy task," she said. "The Egyptian people have legitimate expectations for a better life and greater social justice." An IMF loan, say observers, would serve to boost confidence in the Egyptian economy and lure foreign investment back to the country. In exclusive statements to Ahram Online, Finance Minister Momtaz El-Said said the loan would be granted to Egypt under the terms of a Stand By Agreement (SBA) – the same kind of agreement that Egypt has been negotiating with the international body since June of last year. SBAs are currently priced at 1.07 per cent, including 1 per cent fixed interest, along with the Special Drawing Rights rate, which currently stands at 0.07 per cent. The SDR interest rate is determined weekly, and is based on a weighted average of representative interest rates on a basket of currencies including the euro, yen, pound sterling and US dollar. The Morsi administration is expected to present Lagarde with a new economic programme upon which the loan will be contingent. Unlike a previous programme, prepared during the last round of negotiations in February, the new programme is expected to focus more on social justice. For his part, El-Said said that the programme would be similar to its earlier counterpart, albeit based on suggestions and comments posited by the fund's technical team. Such programmes aim mainly at stabilising economies and streamlining fiscal policy. They focus largely on improving tax collection and reducing spending. In the Egyptian case, extensive fuel subsidies have been a perennial target of the IMF's talks with the government in the ongoing quest to reduce the deficit. Egypt's state budget deficit for 2012/13 is projected at LE140 billion, representing almost 8 per cent of national GDP. To cover the deficit, the government resorted to borrowing from the local market, causing liquidity to dry up and pushing yields on treasury bills up to 16 per cent per annum. An injection of funds from abroad is seen by many as necessary for stabilising the Egyptian economy. Moreover, the country's balance-of-payment deficit, which continues to widen due to low foreign currency inflows, has served to put immense pressure on the Egyptian pound. Ever since last year's Tahrir Square uprising, which unseated longstanding president Hosni Mubarak, the Central Bank of Egypt (CBE) has used its once-extensive foreign currency reserves to prop up the Egyptian pound. Egypt's foreign currency reserves – which had stood at $36 billion in January 2011 – fell to $14.42 billion in July after inching up for three months in a row. At their current levels, Egypt's reserves can only cover three months of imports. 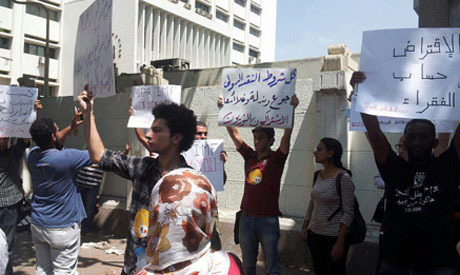 Dozens of demonstrators, meanwhile, protested outside the Cabinet building in downtown Cairo during Lagarde's visit. Protestors, consisting mainly of leftist and revolutionaries, called on Egypt to reject the loan. They chanted slogans and held signs against the proposed loan –and capitalism in general – such as "No to crony capitalism," "Down with capitalism," and "Reject the loans." "Why did we have a revolution? Wasn't it to improve the living conditions of the people? We know that the money from these loans is pilfered by the authorities and will only lead to the further impoverishment of the people," protest organiser Mary Daniel told Ahram Online. IMF and World Bank loans are notorious among leftist activists in Egypt, as in the rest of the world, as they are generally seen as a means of spreading capitalism throughout the world. Notably, Islamist political forces – which rejected a similar IMF loan offer last April – were nowhere to be seen in Wednesday's protest. In April, Egypt's Islamist-led parliament said that the government's economic programme failed to provide details on how the key problems facing Egypt's economy – namely, unemployment and security – would be solved. Some Islamists went so far as to say that such loans were haram (religiously proscribed) since they relied on interest, which is forbidden according to the tenets of Islam. Move forward or spiral down? People by nature are not socialist - they are individuals looking for self achievement even if they promote a so called socialist agenda. The role of the government is to provide the environment in which it becomes possible for the individual to thrive which means providing physical security, education, infrastructure, medical care, the ability for people to express themselves without fear of reprisals and help for the deserving needy. In order to accomplish these goals a strategy and funding is required. Considering the total mismanagement of the country by the previous regimes, the image that Egypt has currently created internationally and the acute lack of money, it seems to me that an IMF loan may be the preferred way to go. If the social conditions attached to this loan are to promote freedom and justice in Egypt I do not understand how anybody who stands for these values and a good future for Egypt can be against it.